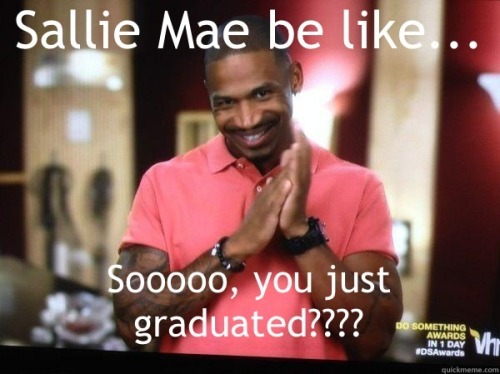 Is Sallie Mae Helping or Harming Black Millennials? For almost the past 50 years, there has been a shift in the American Dream of success, especially in regards to black families. Civil rights laws opened doors to education. Colleges and universities began to flood with women and minorities who previously weren’t welcomed at institutions of higher learning. By the time the generation of Americans called Millennials were born in the early 1980s, “go to college” was a required step in adulthood. A degree should equip students with skills and knowledge they need to be productive members of society. And for many black families who are sending their first generation of college students off, this is the first step of building wealth. The formula hasn’t been so simple, however. Graduating into the yawning mouth of a recession, many Millennials find themselves both jobless and penniless, their dreams swallowed up in a harsh reality. In mainstream media, the growing sentiment is that the “microwave generation” is lazy and doesn’t want to work hard for their success. Last week, blogger Sydette Harry sparked a conversation on Twitter with her hashtag #millenialsofcolor, alternately (and correctly) spelled #millennialsofcolor. The topic resonated with me. Consequently, ah, I went off on Twitter. Stories re: millennials exclude #millennialsofcolor who were drilled by elders EDUCATION above all as means to success. We are not lazy. Also, when it’s been determined that job placement is highly influenced by network, where does that place #millennialsofcolor? I’ve been talking informally about the student loan crisis in America for a while now. Student loan debt has reached $1 trillion dollars and defaults are through the roof. 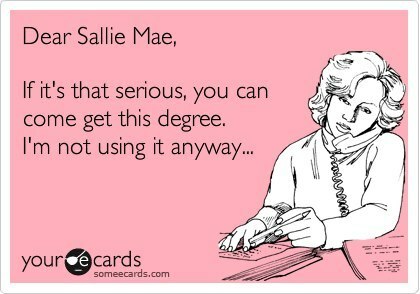 I have several issues with student loans and the company Sallie Mae, which often serves as a stand-in target for this topic. First, a little background. It wasn’t always so easy to take out a student loan prior to the passage of the Higher Education Act of 1965. This legislation enabled institutions to offer financial aid for students unable to afford the cost of college. In 1978, the Bankruptcy Code eliminated the ability to discharge student loans like other debt, and the 1990s saw other laws passed restricting that discharge to a hard-to-prove undue hardship clause. Even with these stark consequences, many people still take out student loans…because they have little other choice. The cost of college has risen over 1205% percent since Millennials were first born in 1980. Arguably, this has affected the entire country adversely, but the gap between rich, poor, and the dwindling middle class is only growing wider. Higher education costs mean that more poor people (27.4% are black) cannot afford college. Without college, they cannot find decent-paying jobs. So, for them, student loans are a beneficial Catch-22. During school, none of my peers knew their projected monthly loan payments. I believe that one great failing of higher ed and the loan industry is not adequately preparing students for the anvil that is to come. There should be yearly, semesterly, or quarterly counseling and regular updates as to the actual dollar amount that will be required. Once you graduate, the reality of your student loan payment hits you very quickly. At the beginning of the recession, in 2007, it took me three months to find a job. I’ve known people for whom it took longer. Most student loan payments are due within six months of graduation. You may defer, but even that has adverse financial consequences in terms of interest accrual and loan amortization. I know of little to no people who have been able to wrest the albatross of student loans from around their neck. There are plenty of links on the Sallie Mae website to counsel you to avoid default, but very little help once you are in it. No mercy and no mitigating circumstances. That payment, sometimes upwards of $500 monthly, prevents saving and investing, and can detract from the ability to take out mortgages or fund children’s college tuition. Baby Boomer black parents, already facing bleak retirement prospects, must take responsibility for those payments if they co-signed for their adult child’s student loan. How can I legit tell teen #millennialsofcolor to avoid student loan debt when costs have tripled since I matriculated? It’s unfair. I have long wanted to preach the gospel of “Avoid Student Loans!” to high school students. But this would be unfair and hypocritical. I took out a small loan in graduate school and was able to pay it off, but that was nearly a decade ago. Costs have risen since then, and it may be impossible for students with financial hardship to attend school without loans. Without a vocational plan, telling kids to skip college is akin to sentencing them to lower salaries. But are we not currently asking them to mortgage their futures with Sallie…so they can’t afford a real mortgage later? For as many testimonies that I hear about the crippling debt black Millennials are carrying, I hear mingled amounts of regret and pride. Not one student regrets attending school. We are some brilliant people, ya’ll. We’re carrying the load, sometimes struggling, but our parents taught us to be hustlers. The grind doesn’t stop at graduation. And for our children, we can’t stop. We have to be proactive with the next generation and teach them how to smartly manage their debt, if they choose that route. But we also need to advocate for more nuanced underwriting of student loans. We cannot saddle 18-25 year-olds with the debt load of a small mortgage without allowing for future wages and earnings. We have to fight for fairer rules for discharge in bankruptcy and mitigated higher education costs. Because I don’t want to be afraid that allowing my daughter to attend college will constitute the worst decision of her young life. i hope and pray its for the best and not to harm us as a people. Great post, also dreaded my post degree happiness. Thank you! I feel you…that high cuts off real quick when you realize somebody is coming for your wallet quicker than you can land a job. smh.